Molalla is one of six Oregon towns taking part in a program created by the Oregon State University Extension Service in 2011 to prevent weight problems in rural children. Called GROW Healthy Kids and Communities, it’s a five-year project that helps families and communities develop strategies that promote weight-healthy habits. The program takes place in Columbia, Clackamas and Klamath counties as well as in five other western states. It’s a misconception that rural kids are healthier than their urban counterparts, said College of Public Health and Human Sciences (CPHHS) Assistant Professor Deborah John, who co-directs the project with Associate Professor Kathy Gunter. “We’re finding that rural communities have fewer options for children and families to eat healthy and be physically active because residents often live far away from school, work, parks and grocery stores,” she said. John said that researchers selected Clackamas County, where Molalla is, because it includes an urban center surrounded by a large rural area. They chose Molalla because of its size, demographics and supportive partners, she said. The town of about 8,000 people is almost an hour south of Portland, has one major grocery store, and its elementary school lacks a P.E. teacher. Two-thirds of its students are eligible to receive free or reduced-price lunches from the National School Lunch Program, according to the Oregon Department of Education. To get a more authentic insight into Molalla, researchers began their project by inviting residents to assess their own needs, said Extension’s Beret Halverson, who’s leading the program in Clackamas County. Residents used handheld GPS devices to map and photograph places where they could buy healthy food and exercise, such as parks, schools, and the town’s only gym. Researchers wanted to know not only which resources already existed, but also how residents used them, said John, an Extension specialist. Participants learned that their community had limited access to free and low-cost options for physical activity and healthy food, Halverson said. They discussed their findings in several town hall-style meetings. Residents then formed a group and spearheaded several initiatives to address these needs. The group launched a campaign called “Let’s Move Molalla!” to encourage families to walk and run together. The community is working to make running and walking more accessible through family discounts on local races, community gatherings and clothing drives so that people can receive shoes and attire suitable for running or walking. About 100 people have participated in the mapping project and the action team, Halverson said. 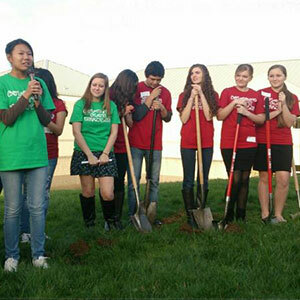 Mapping data helped the 4-H Culture Club gain enough momentum to break ground on a new garden at Molalla High School in March. The data demonstrated the need to improve the local food system and helped the club secure a $5,000 grant from PacificSource Foundation and the CPHHS Extension program Youth Advocates for Health. Businesses and community organizations have also supported the school garden, which is Oregon’s 500th. Halverson and Extension educator Erin Devlin are offering technical advice and educational support to the club’s leader, Kelly Douglas. This summer, 4-H Culture Club members will use handheld GPS devices to map and photograph which neighborhoods don’t have as much access to low-cost healthy food, then set up produce stands for those areas, Halverson said. 4-H’ers will also sell low-cost produce to their classmates after school and when the cafeteria is closed. Also as a result of the GROW program, residents also identified a need for a fitness trail at Molalla Elementary School. They found there were not enough free, centrally located places to exercise, and many schoolchildren were overweight or obese, Halverson said. So Extension helped the school secure $18,000 in grants to build a gravel trail for walking and jogging. The trail includes fitness stations and soon-to-come gardening stations, which might include raised beds. Additionally, Halverson and Devlin created a grant-funded, before-school student club that uses the trail and encourages members to walk or run 100 miles. So far, 75 children have walked more than 3,000 miles, said Robin Bergin, a counselor at Molalla Elementary. Fourth-grader McKenna Salvetti and fifth-grader Zara Hill are club members and have logged 15 miles and 25 miles, respectively. “I think it’s really fun and cool about our trail. All the kids really wanted one and haven’t had one,” said McKenna, who walks about three times a week when the weather is nice. To evaluate whether children such as Zara and McKenna are staying healthy over the long haul, Halverson and Devlin measure the height and weight of children several times each year. They invite families to participate in the research. Family members can wear accelerometers, a type of activity monitor, as they go about their daily activities. They can also answer surveys about what they’re eating and how active they are as a family. These data will tell researchers whether changes to school and community environments that provide greater access to physical activity and healthy eating affect the health of Molalla children over time.